Mercury vapor lighting is the oldest HID technology. Because they have a large installed base, there continues to be applications for replacement and retrofit lamps. From street lighting to parking lots, major portions of our infrastructure depend on this century old lighting technology. 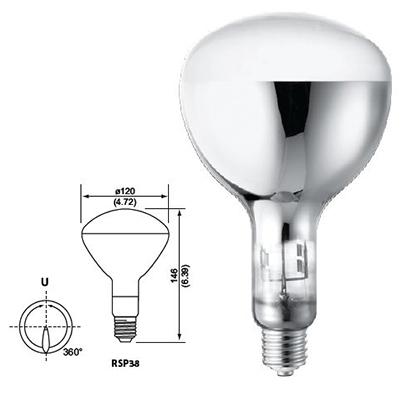 There are two types of mercury vapor light bulbs sold in the U.S.
Mercury vapor lamps have found the greatest use in industrial applications and outdoor lighting, because of their low cost and long life, and lamp sizes of up to 1,000 watts. Because mercury lamps are so prevalent in current outdoor lighting, and still safe when properly installed in a serviceable fixture, the need for these products will continue for many more years. There are two designs of mercury lamps in use today, each having some of its own distinctively different applications. Standard mercury vapor lamps are generally used to overcome problems with fluorescent lamps for outdoor use. As we reviewed in our earlier blog; Are Mercury Lamps Still Legal?, existing mercury lamp systems should always be considered for retrofit with other high efficiency alternatives, unless they operate very few hours a year and/or the fixture has a long remaining service life. Standard mercury lamps are three times as efficient as incandescent. They are available in a wide variety of ratings, colors, sizes and shapes. Plus, their relatively low unit cost and high average rated life makes them economic alternative to full replacement until the fixture’s service life is diminished. Standard mercury vapor lamps have found greatest use in industrial applications and outdoor lighting, because of their low cost and long life (16,000 to 24,000 hours), with lamp sizes ranging from 40 to 1,000 watts. Self-ballasted mercury vapor lamps are designed to operate directly in incandescent sockets, without ballasts or new fixtures. 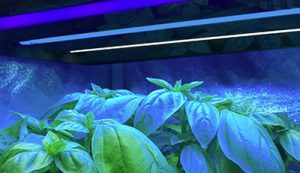 These lamps use a special built-in filament coil that controls both starting and operating currents. The light output of a self-ballasted lamp is a blend of incandescent and mercury vapor light. This results in a warmer color appearance and higher color rendering than standard mercury lamps. Further improvement is achieved in many of the lamp types by the addition of a phosphor coating to the inside surface of the outer bulb. In most cases, self-ballasted mercury lamps may be operated in any position. Most self-ballasted lamps feature a weather resistant outer bulb, which is also resistant to thermal shock and to environmental conditions found in industrial applications. All self-ballasted mercury vapor lamps will extinguish if the outer bulb is punctured or broken. 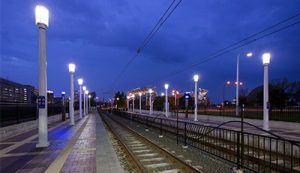 Self-ballasted mercury vapor lamps provide significantly longer lamp life and slightly higher efficacy than the incandescent types they replace. 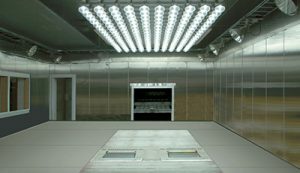 As a result, they are used most often where lamp replacement is inconvenient, expensive or disruptive to operations, and where capital funding isn’t available for retrofit to a conventional HID source. The rated average life of self-ballasted mercury vapor lamps range from 12,000 to 16,000 hours and light output is 14 to 24 lumens per watt. Self-ballasted lamps designed to operate on circuits above 200 volts are more efficient in producing light than the 120-volt types. It’s particularly important that the supply voltage matches the operating voltage specified on a self-ballasted lamp. Otherwise, the lamp’s performance, including start-ability, light output and life, may be adversely affected. Once again, because of the large install base and long service life, mercury lamps will serve an important role in commercial applications for many more years. It is important to know what lamps serve the best applications.